Los Angeles has added its name to a growing number of individuals, organizations, and cities that are calling for the U.S. to take action to prevent nuclear war. On Aug. 8, the Los Angeles City Council voted to approve a resolution that urges the U.S. to embrace the U.N. Treaty on the Prohibition of Nuclear Weapons and implement important protective policies such as ending the president’s sole, unchecked authority to launch a nuclear attack, taking U.S. nuclear weapons off hair-trigger alert, and canceling U.S. plans to replace its entire nuclear arsenal with enhanced weapons. 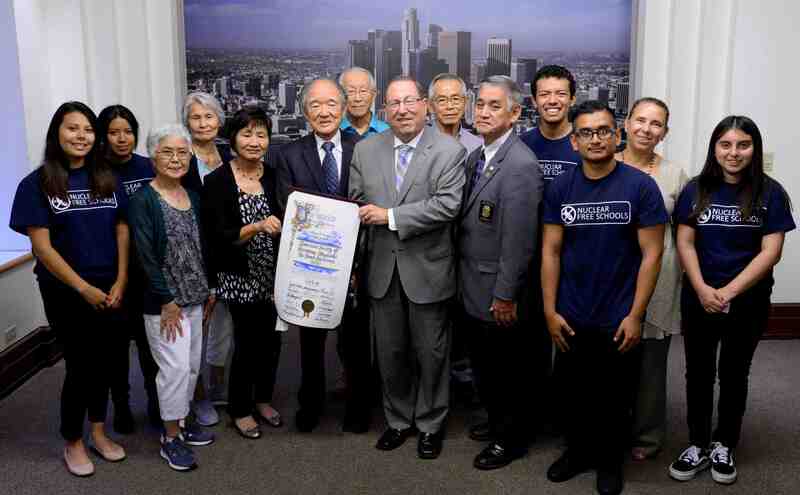 The resolution, timed to coincide with the 73rd anniversary of the Hiroshima and Nagasaki atomic bombings on Aug. 6 and 9, was introduced by Councilmembers Paul Koretz and Mike Bonin. The L.A. resolution is part of a national grassroots campaign called “Back from the Brink,” which has support from prominent public health, science, environmental, faith-based and justice organizations. The U.S. Conference of Mayors voted unanimously in June to support a similar resolution, and cities throughout the country are following suit. Los Angeles is now the largest city to do so. The U.N. Treaty on the Prohibition of Nuclear Weapons endorsed in the resolution also has broad support, from the American Medical Association to Pope Francis to former Secretary of Defense William J. Perry. The treaty, which was adopted last year with the support of 122 countries, bans nuclear weapons in the same way that biological and chemical weapons are banned. The U.S. and other nuclear states currently oppose it. “U.S. leaders have been derelict in their duty to develop a sustainable security framework and achieve a world without nuclear weapons,” said Beatrice Fihn, executive director of the 2017 Nobel Peace Prize winner, the International Campaign to Abolish Nuclear Weapons. “With this action, the L.A. City Council is joining the movement bringing democracy to disarmament and declaring that the people of Los Angeles have a right to live free from the fear of imminent destruction and reject the use of these weapons of mass destruction in their name. Paul Kawika Martin, senior director for policy and political affairs for Peace Action, also noted the significance of the L.A. resolution. “Representing one of the largest cities in the country, the L.A. City Council just passed a common sense resolution calling for reasonable steps to reduce the threat of nuclear war. More and more cities are stepping up efforts to challenge Cold War-era nuclear policies and outlandish escalations in nuclear weapons spending that make us less safe. “Angelenos are sending a powerful message that emphasizes the value of diplomacy and human life, and calls out the current nuclear system as out of sync with American principles of democracy and justice,” said Yasmeen Silva, a representative of Beyond the Bomb. “With nuclear war only a tweet away, legislators across the country are showing the American public that they won’t stand idly by while their constituents are put in danger. Prior to the resolution vote, the city presented the American Society of Hiroshima-Nagasaki A-Bomb Survivors (ASA) with a commendation for their decades of nuclear disarmament efforts. “ASA and [the late]Kaz Suyeishi, we have been educating the public about the catastrophic effect of the atomic bomb on human beings,” said Junji Sarashina, president of ASA. “We are very happy to be recognized for our efforts for the past 50 years. ASA members present for the commendation also included Midori Seino, Toshiyuki Seino, Hiroko Nakano, Taeko Okabe, Howard Kakita, and ASA Honorary Director/Historian Gloria Montebruno Saller. Nakano said she was delighted to share the news of the commendation with her older brother, who lives in Nara, and her daughter, and she thanked everyone who made it possible. “For decades, you have worked at telling your stories so current and future generations truly understand the devastation caused by nuclear weapons,” Koretz told the survivors. The resolution was also supported by Fukushima Support Committee, Interfaith Communities United for Justice and Peace, International Campaign to Abolish Nuclear Weapons, International Physicians for the Prevention of Nuclear War, Nuclear Age Peace Foundation, Nuclear Free Schools-Alliance Dr. Olga Mohan High School, SoCal 350 Climate Action, Veterans for Peace, and Women’s Action for New Directions. We must all examine our relationship with power, and how it is the root of conflict, from the smallest war to the largest. Historically, all the evidence points towards nuclear war. The pattern of history is clear. Power (manifested as interest) has been present in every conflict throughout history – no exception. It is the underlying motivation for war. Other cultural factors might change, but not power. It is the one thing we will destroy ourselves for, as well as everyone else. When core interests are threatened and existential threat looms nations go to war. There can be no compromise on these. As a result every civilization/nation eventually gets the war it is trying to avoid: utter defeat. This applies as much today as any other time in history. Deterrence doctrine, made for the 20th century Cold War, is irrelevant in the 21st and will ultimately fail us. Unfortunately, leaders and decision-makers delude themselves, thinking they can avoid this fate – they can’t. If survival is threatened, there is no alternative to war, however destructive.